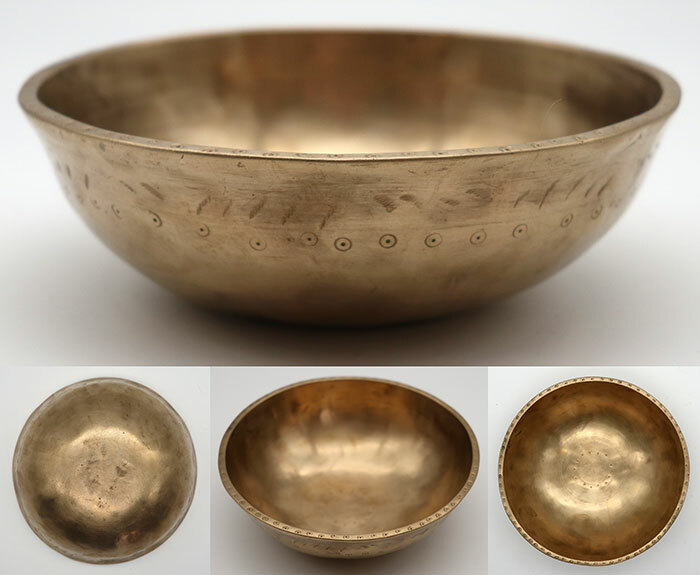 This is a superb tiny example of the Manipuri Singing Bowl form, with all the decorative feature one could wish for. The fundamental note is a fifth octave Bb (926Hz) when struck or played around the rim. There are circles at its centre including a ring of suns (dots within circles), a chain of suns around the lip, and another band of suns set within incised parallel lines encircling the outer wall below the rim. Above these, at intervals, are a series of ritual gashes. This lovely little bowl, whilst showing signs of long use, is in excellent structural condition and has a shiny bright golden bronze colour. A Tibetan silk brocade cushion and 2 small ringers are included in the price.